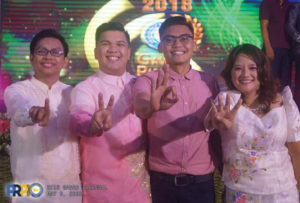 Pangasinan State University Lingayen Campus (PSU-LC) recorded a four-straight-finish in “Gawad Parangal para sa mga Natatanging Mag-aaral ng PSU” as another student-nominee from the said campus was named as the newest “Pinakanatatanging Mag-aaral” during the recently concluded awarding program held at the PSU Convention Hall on May 9, 2018. PSU-LC recorded a four-peat victory in Gawad Pangaral as Pinakanatatanging Mag-aaral ng PSU with Menard P. Nava, Mark Marlon P. Nava, Mohamed Ardaniel C. Swandi , and Patrice A. Flores from 2015 to 2018, respectively. Patrice A. Flores, a student of PSU-LC taking up Bachelor in Secondary Education major in Physical Science, was hailed 2018 Pinakanatatanging Mag-aaral ng PSU. Her victory sets the four-peat record of LC following her predecessors namely, Menard P. Nava, Mark Marlon P. Nava, and Mohamed Ardaniel C. Swandi, who received the same highest student recognition in 2015, 2016, and 2017, respectively. The LC’s four victors have something in common as they are proud alumni staffers of CAST Chronicle, the official student publication of PSU-LC. Meanwhile, Flores set a record to be the first female student who hauled the title. Flores garnered a total rating of 81.16% with a breakdown of 45% for academics, 19.64% for co-curricular, and 16.52 for panel interview. The nominees were ranked based on three categories such as academics using the overall GWA (50%), co-curricular activities (30%), and panel interview (20%). During her speech, she shared her inspiring life story that stirred binary emotions to the spectators. It is very difficult for her to retrospect to the days of her childhood as she doesn’t know the feeling of having a father who will protect and take good care of her. She doesn’t know also the feeling of having a mother who will cook for her breakfast before going to school. However, she stressed how thankful she is because of the undying love of her grandmother who is there to support and guide her at her most trying times. The student recognition program dubbed as Gawad Parangal para sa mga Natatanging Mag-aaral ng PSU is an annual search for outstanding PSU students being conducted through the Office of Student Services, the University’s pillar in students’ welfare. The program aims to recognize students who have excelled academically and in co-curricular activities. The application for the fourth Gawad Parangal was open to all regular graduating students. The applicants were enrolled in any baccalaureate program of PSU for at least three years. Also, they had no failing grades and must have at least a general weighted average (GWA) of 1.75. Meanwhile, Prince Ricky A. Varona, the student-nominee of PSU Bayambang Campus, was given an 18.86% rating that made him outbested the other eight nominees during the panel interview conducted at the PSU Main Accreditation Room on April 26. The activity was conducted for the second time since it was introduced last 2017. The nine PSU students who made way to represent their respective campuses as finalists courageously showed their public speaking prowess to the panel of evaluators. It aimed to test the public speaking competence of the student finalists with the following criteria: ability to present/clarify/articulate ideas (45%); manifestation of critical thinking skills (20%), linguistic competence (15%), self-confidence (10%), and personal appearance (10%).